Looking for a fresh take on a simple baked chicken recipe? 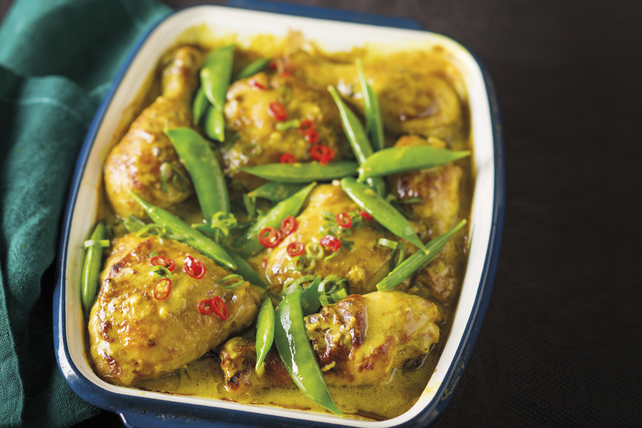 Our savoury Turmeric-Coconut Baked Chicken only takes 9 ingredients and 15 minutes of hands-on prep time – and it bakes to juicy perfection. Your family and friends will definitely be asking for this recipe! Place chicken pieces, skin sides up, in shallow baking dish sprayed with cooking spray. Whisk all remaining ingredients except snow peas and chiles until blended; pour over chicken. Turn to evenly coat both sides of each chicken piece with coconut milk mixture. Bake 40 to 45 min. or until chicken is done (165ºF), adding peas and peppers to baking dish for the last 3 min. To blanch the snow peas, add the trimmed fresh snow peas to large pan of boiling water. Cook 1 to 2 min. or until peas are bright green in colour. Drain, then immediately plunge snow peas into bowl of ice water to stop the cooking process. Let stand until peas are cooled. Drain, then use as desired.